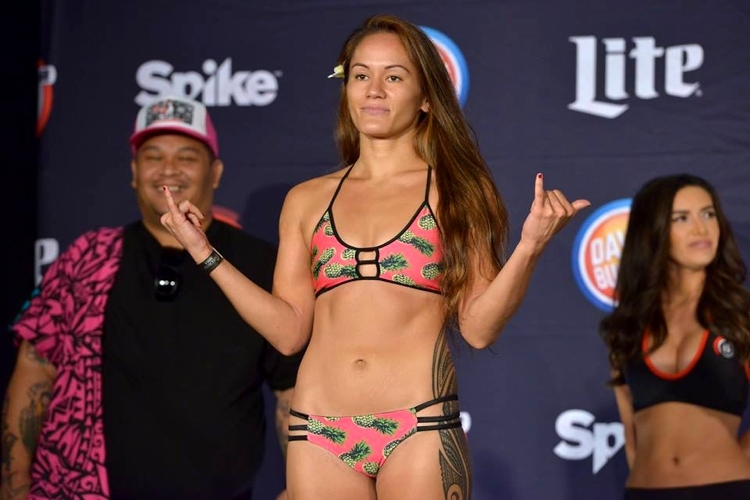 For her first fight of 2016, flyweight prospect Ilima-Lei Macfarlane had the strongest performance of her career yet, when she submitted Amber Tackett in the first round at Bellator 148 in January. And while Macfarlane is happy with the win, she does wish she could have gotten a bit more cage time in the fight for experience. “That was pretty much the game plan,” Macfarlane told MMAWeekly.com. “(Tackett) was a southpaw, and I’d never faced a southpaw opponent before, so we kind of wanted to take her down. As far as we knew, she didn’t have any ground game. Macfarlane (2-0) will look to pick up her third straight win for Bellator when she takes on veteran Rebecca Ruth (6-1) in a 125-pound main card bout at Dynamite 2 on Friday in St. Louis, Mo. “She’s definitely going to be my toughest opponent to date, and ‘Ruthless’ is a perfect nickname for her, because she comes forward, always keeps the pressure on and is not afraid to get hit or throw down,” said Macfarlane of Ruth. “I think that this is really going to be a really good brawl.